When you go in for your annual health examination, the doctor will often ask you a series of questions. For example, are you sleeping well? Do you have any aches and pains? How is your diet? The purpose of these questions is to assess your health and unmask any underlying symptoms that could point to a larger issue. Over the years, we have found that by looking at a custodial closet, we can assess the health of a cleaning organization. The janitorial closet reveals key details not only about the cleaning worker, but also the management of the building. A dirty custodial closet is like a fever. It shows us that there’s something wrong somewhere in the operation. Safety, training and purchasing issues can all be uncovered in a janitor’s closet. 1. Is equipment dirty? You can’t clean with dirty tools and equipment. Dirty vacuums belch out dust throughout hallways and dirty squeegees leave streaks on glass. Dirty microfiber cloths can lead to cross contamination and filthy bottles can lead to dirty hands—and potential safety issues. Dirty equipment reveals insights into your preventative maintenance program, or lack thereof. It also reveals how employees are treated and the effectiveness of your training program. 2. Is the room cluttered? Clutter shows disorganization. Maybe custodial workers are bringing in personal items or hoarding cleaning supplies. It might mean that you need to talk to them about scheduling or provide additional spaces for them to take breaks. Cluttered closets are a safety issue — people can trip and fall in a cluttered space, or hurt themselves from improper lifting. 3. Do you have access to all the closets? You might laugh, but you’d be surprised how many custodial operations we go into where custodians have changed the locks because they don’t want other people to have access to their closet. If you can’t access or see inside every closet, there’s a good chance that someone is hoarding equipment and supplies. 4. What’s on the shelves? Are cleaning chemicals clearly marked? Are there several brands of the same product? This can lead to confusion and inconsistency throughout other areas of your operation. It can also present a potential safety issue, if custodial workers aren’t clear on what chemical they should be using and when. 5. 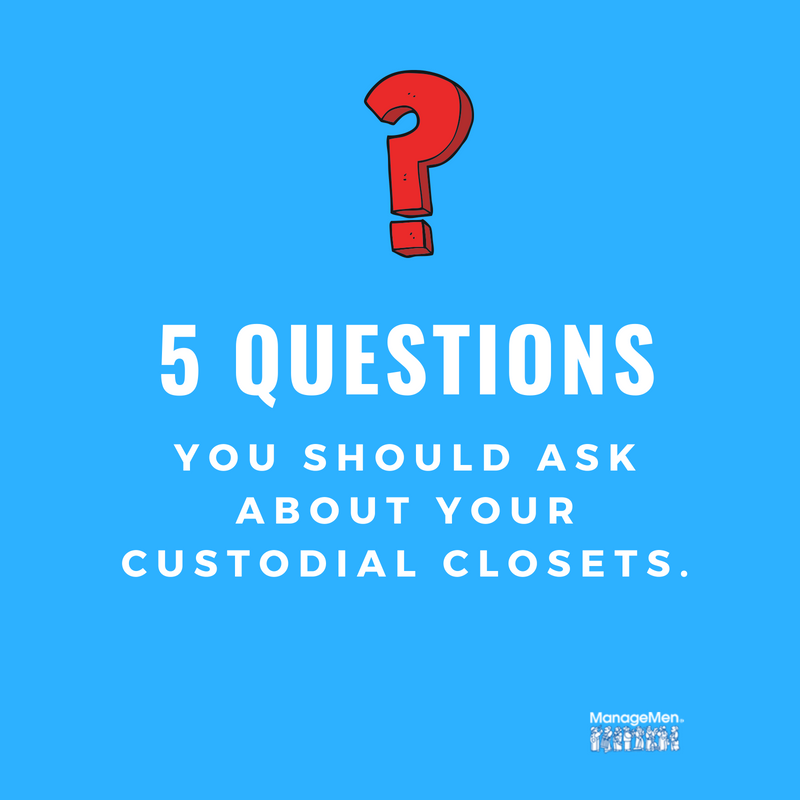 Is the closet serving as a makeshift office, break room and/or chemical storage area? This is the biggest sign that your cleaning program has been mismanaged. Custodians typically don’t like to bother people. In fact, many times they’re so used to being invisible in an operation that they won’t ask for things they need – like space, storage and equal access to break/common areas. Many times they’ll choose to take lunch, breaks, or worse, hide out, in closets because they’ve been given the message that they don’t belong in the building. Few people enjoy a trip to the doctor, but it’s one of those things you should do even when you feel healthy. 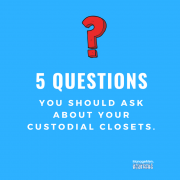 Asking just a couple of questions about the health of your custodial closets can help diagnose larger issues within your operation.